Its popularity has been waning in recent years but Ford has now revamped its once popular Mondeo at competitive prices and a high spec level. The new Ford Mondeo Graphite offers non-business buyers a compelling combination of exterior appeal and excellent interior features with prices from £15,995. And, following the success of the Ford Mondeo Zetec Business Edition, the new Titanium X Business Edition offers even higher standards of technology and interior luxury – with improved residual values. This model costs £21,995. The Ford Mondeo is equipped with the newly refined and recalibrated 2.0 litre Duratorq TDCi diesel engine which has CO2 emissions from just 119g/km across both 140PS and 163PS power outputs – that’s a reduction of up to 10g/km. Fuel consumption is improved from 57.6mpg to 61.4mpg. This is the fifth series of the Ford Mondeo and it comes with a wide array of sophisticated features including Adaptive Cruise Control, Forward Alert, Blind Spot Information System, Lane Departure Warning, Adaptive Front Lighting System, Hill Launch Assist and Auto High Beam technology. The new motor also has 17inch spoke alloy wheels, LED daytime running lights, LED rear tail lights, Ford’s EasyFuel capless refuelling system with mis-fuel inhibitor. 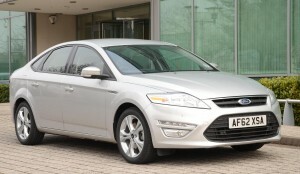 For a better ride in the Ford Mondeo, engineers have developed a sports suspension. Inside the cabin there’s a decent level of kit with a CD/MP3 audio system, Bluetooth hands-free and voice control and ‘Quickclear’ heated front windscreen. In its 20 years of history, the Ford Mondeo has been at the cutting edge of new technologies and built its reputation on being an impressive company and family car and the new series is no different. Over the years, the excellent car has also picked up lots of best family car awards from motoring magazines and websites. The latest incarnation has seen the price being dropped and the spec increased because there is an all-new version being scheduled for launch next year. It’s still a great car to drive and own – though the leasing options for owning a Ford Mondeo will have lower costs than owning one outright. This entry was posted in Car Leasing, Car Updates & Releases, Cars, Eco Car, Executive Cars, Family Car, Manufacturer News, New Cars, News and Views and tagged Adaptive Cruise Control, Adaptive Front Lighting System, alloy wheels, Blind Spot Information System, business edition, car, family car, ford mondeo, Ford Mondeo 2013, Ford Mondeo Business Edition, ford mondeo co2, Ford Mondeo Emissions, Ford Mondeo Graphite, ford mondeo mpg, Ford Mondeo Price, Ford Mondeo Spec, Ford Mondeo Titanium X, Ford Mondeo Zetec, Forward Alert, graphite, Lane Departure Warning, lease the ford mondeo, LED, Mondeo, new ford mondeo, technology by Steve Lumley. Bookmark the permalink.